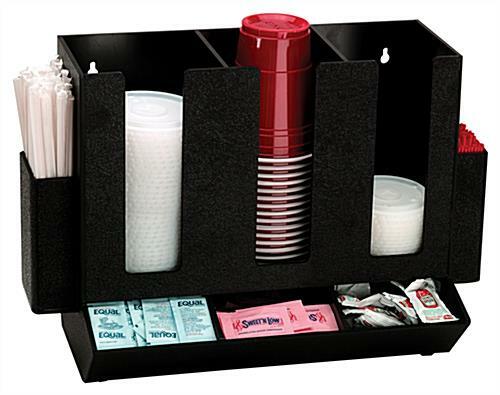 This cup, lid & straw organizer is manufactured from ABS plastic, a tough material with a textured surface that resists fingerprints. 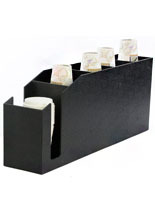 At the center of the drink caddy are three compartments for cups and lids, with two side pockets suitable for stirrers and straws. 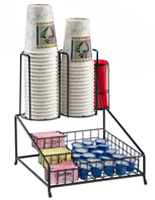 A tray right in front holds sugar and sweetener packets in a user friendly design. 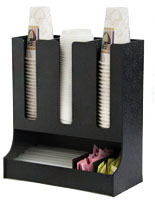 The cup, lid & straw organizer provides efficient use of space for counters, but it can also be wall mounted if you are looking to save counter space. 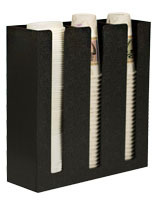 17.4" x 14.5" x 7.5"
4.3" x 8.3" x 4.8"
3.1" x 5.0" x 1.4"
4.3" x 7.3" x 2.8"